Leverage Avid Media Composer's industry-standard project and media sharing with your existing Xsan, StorNext or NFS-based* storage. What's new in SAN Fusion. SAN Fusion 1.5 adds support for NFS-based storage repositories. Work exactly as you would on an Avid Unity or ISIS using your existing shared storage platform. Simply install SAN Fusion and within minutes you can start leveraging the industry-standard project and media sharing feature set of Avid Media Composer. SAN Fusion is 100% client-based with no additional hardware or minimum number of seats to buy. Shared storage’s dirty little secret. 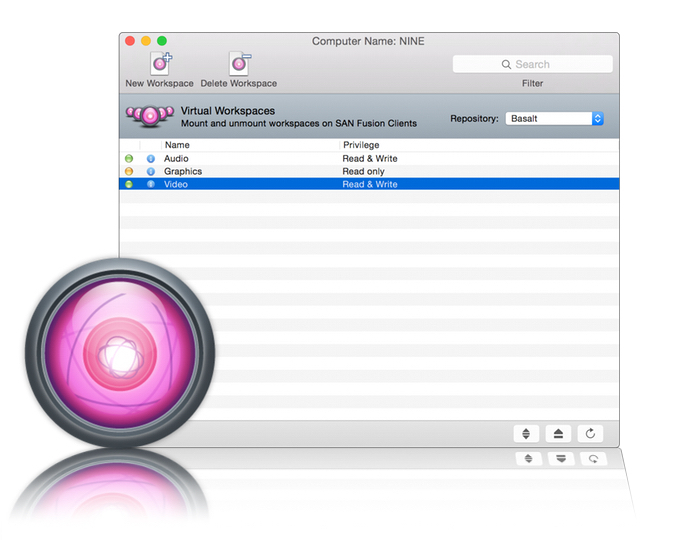 SAN Fusion’s virtual file system allows editors using Media Composer to work as if they were connected to an Avid Unity or ISIS using existing Xsan, StorNext, or NFS-based shared storage. Xsan “Native Extended Attributes” are not currently supported. StorNext “Named Streams” enabled volumes are not currently supported. Maximum file system tested for compatibility is 256 TiB; however, larger file systems have been reported to work without issue. Support for NFS-based Workspace Repositories requires a qualified NAS appliance. The maximum file system size SAN Fusion supports for a single NFS volume is 64 TiB. To find out which NAS appliances have been approved for use with SAN Fusion, please contact info@sanfusion.com. Please contact Panasas for more information about PanFS 6 with DirectFlow® for Mac®. “The editing application will notify you if your third party storage is emulating Avid NEXIS or Avid ISIS storage. Once you access a project connected to storage that is emulating Avid NEXIS or AVID ISIS storage, you will receive a message asking if you would like to enable bin sharing on your third party storage. Click Yes in the message to enable the bin sharing option in the General Settings. See how SAN Fusion can help you. Alex Grossman of Quantum explains why he likes SAN Fusion. Copyright © 2013-2019 SAN Fusion, LLC. All rights reserved. As of March 1, 2019, the Compatibility Support Matrix for Avid NEXIS Enterprise and PRO still only lists the supported versions of Media Composer as v8.8.5 - 2018.11. However innocuous as it might seem, we believe the omission of v2018.12 from this list could hint to compatibility issues when trying to use the latest version of Media Composer in any shared storage environment. Therefore at this time, our recommendation is to avoid using v2018.12 with SAN Fusion without performing additional in-house testing prior.